Woodworkers are pack rats of the highest order. I am in the middle of making two classical guitars, one is a close copy of a 1926 Domingo Esteso, the other one a close copy of Andres Segovia's famous 1912 Manuel Ramirez guitar. 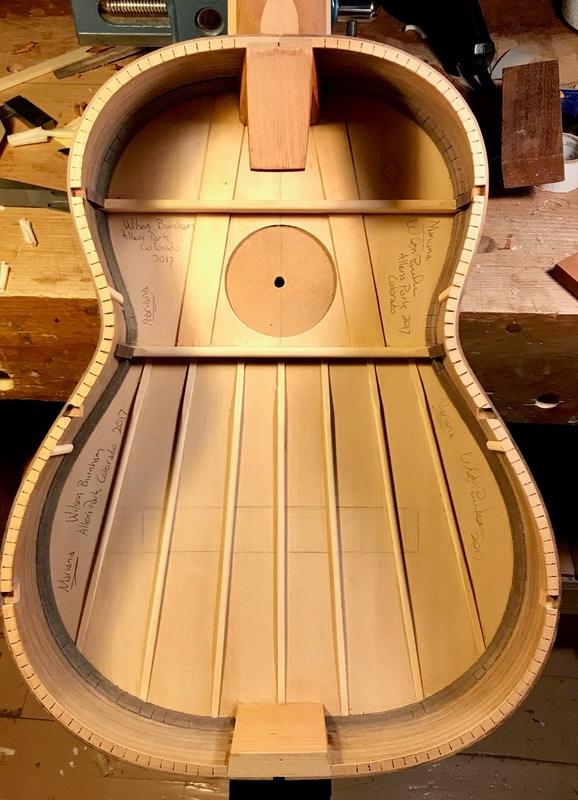 The Esteso style has a 640mm string length on a body smaller than the Ramirez style, almost three quarters of an inch shorter, and the Ramirez is fairly textbook, meaning that from the outside it looks like a 1912 Ramirez guitar. The inside is braced a little differently than the original, but the "fan" pattern of bracing was in use in the Ramirez shop at the time. In all of this chaos of scraping down bindings, glueing on fret boards, making bridges, etc., I realized that I needed to rehabilitate my chisel-tool rack. 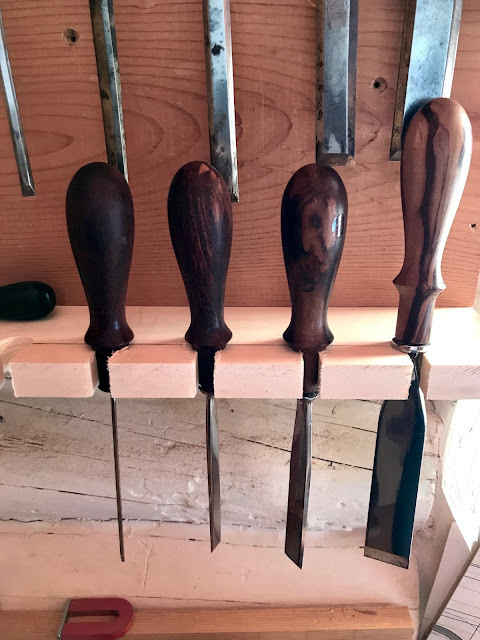 There were chisels and pliers on the floor of the studio because there was no place to put them, a problem that needed a remedy. 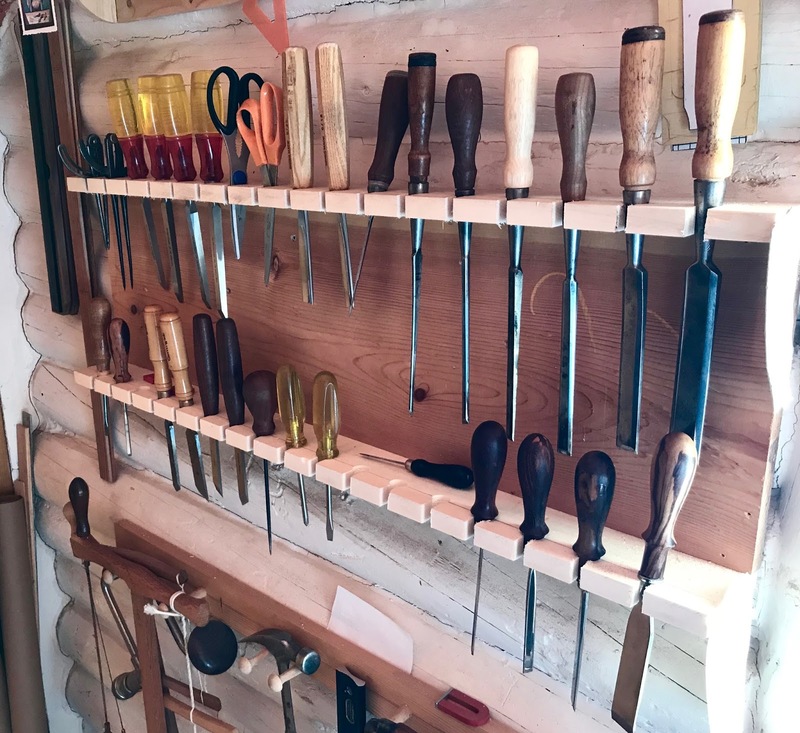 The original rack was patterned after a French tool rack that was popular a few years ago, it worked but my tool collection had grown. You can read about the old rack elsewhere in this blog. My solution to the problem was to add an extra rack on the bottom of the backing board. The backing board is a piece of 1x12 pine that is 36 inches long. The top rack is a piece of pine that I ripped to 2 7/8" wide, the bottom rack was ripped to 3 3/4" wide. Both racks are attached with screws to the outside edges of the backing board, the different widths of the rack provide an offset from the rows of tools. When you remove a tool on the bottom rack the tool's handle and your hand have some clearance from the tools in the upper rack. The holes are set 2 inches on center, this gave me 17 holes for each rack, the holes are 5/8" in diameter and were drilled on a drill press. The slots are about a 1/4" wide and cut with the help of the miter gauge on my table saw. It holds most of the tools used on a daily at the ready. Does it need to be bigger? Yes, but I will deal with that when I complete my new workshop, for now this rack is good enough! 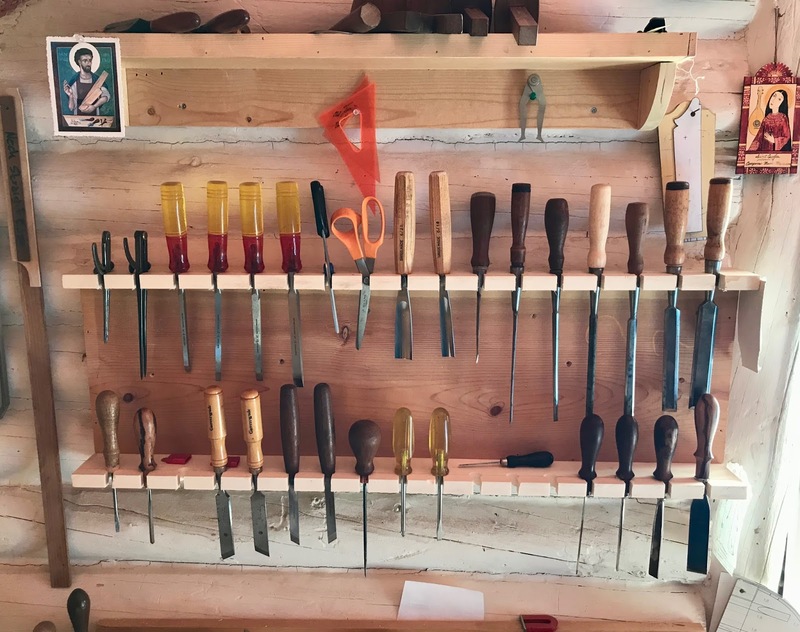 If you are wondering why there are three empty spots in the lower tool rack, it is because I haven't re-handled three new chisels I purchased from Luthier's Mercantile Inc., the empty space in the upper rack is for a pair of vintage PEXTO dividers that must have been on the workbench when I took the photo. 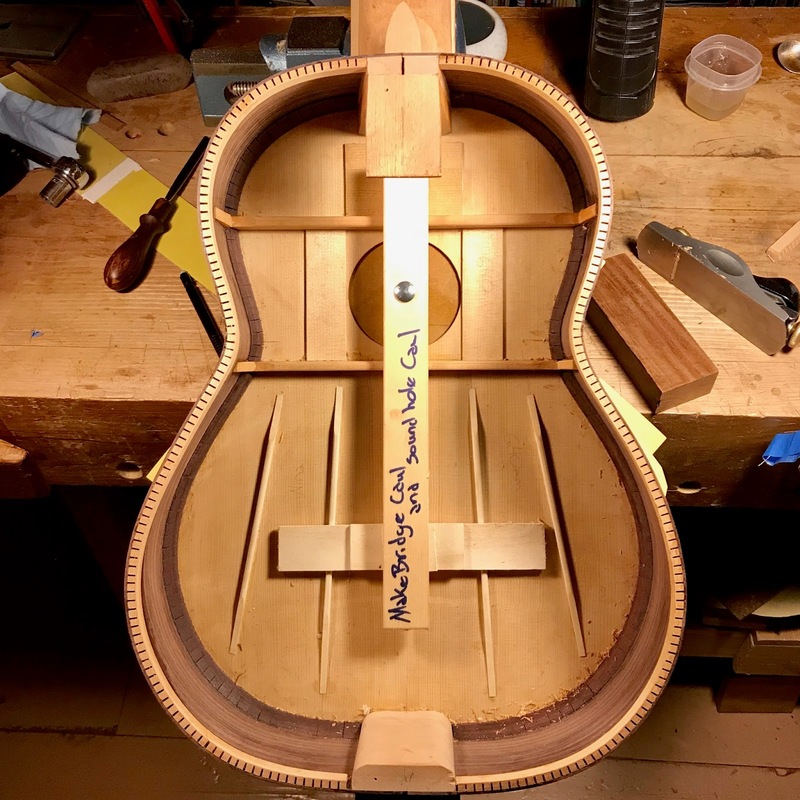 Here is a YouTube video of Kyle Throw, a young composer/classical guitarist, in Denver, Colorado, playing a spruce/granadillo guitar that I made for him! Enjoy!